All Star glamour. 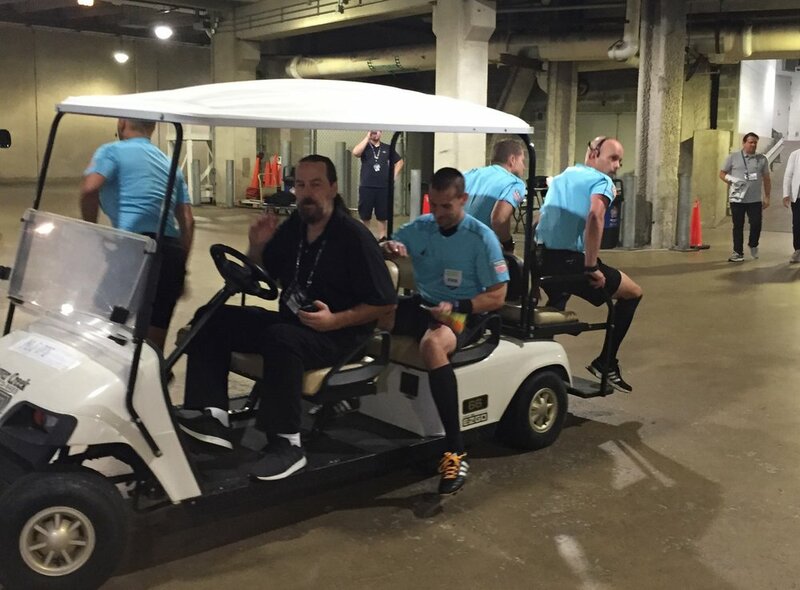 The All-Star crew get a ride from their locker room to the location of the walk-out at Soldier Field. You will note that I have added a VR (video review) note to each video clip presented this week. Easily the most talk about play of the week was this situation in Houston v Portland, where Portland's Adi interferes with Houston's Leonardo by blocking him from getting into a defensive position. Paul Rejer, PRO Director of Training and Education, has written about it with an emphasis of the Law aspects here in PRO's Play of the Week. For this report we will take a different perspective and try to see if we can improve on the AR mechanics. The final decision is correct. The question is, when should the flag have been raised? The infraction is interfering with an opponent and that means that the offside player has to make a clear action that impacts an opponent. That flag cannot go up until that action and "impact" has happened. Consider that Portland's Adi could have allowed Leonardo to run past him and there would not have been offside. Once Adi clearly blocks and continues to interfere with Leonardo the flag should be raised. In terms of this clip, at 54:09, right before Chara gets to the ball. However, we know from discussions with the AR that he is not sure from his angle if Adi has actually interfered - he needs the other piece of the puzzle from the referee. The subsequent events happen so quickly, including the goal, that he does not receive confirmation from the referee. If you have doubts about the legitimacy of a goal the correct procedure is to stand at the corner flag, as we pointed out last week. PRO AR Nick Uranga does this, and once he is able to consult with the referee, the puzzle is put together correctly. VR Note: This play would have been reviewed and the goal denied as per the decision on the field. If the flag had gone up at 54:09 and the referee whistled at that moment it would not have gone to review. In practical terms once Adi had the ball and was about to score, the referee would not have whistled even if the flag was up, since the goal was imminent and immediate. He would have allowed the goal to set off the review. It is always refreshing to see previous instructions put into practice, which we highlight in this clip. Several weeks ago (Week 13) we pointed out several infractions behind the play in an area where ARs should focus. These are breakaways, where it is important for assistant referees to keep an eye on the play away from the ball. Usually a second attacker moving forward to join the play, especially if no offside decision is imminent. In New York Red Bulls v Montreal it is late in the match when MTL's Ciman decides to take a shot at NYRB's Veron. AR 1 Jeff Greeson has spotted this because no attacker is even close to an offside position and he is rightly focused on the play behind the ball. The misconduct (caution) is correctly given by the referee. VR Note: This play would have been silently checked by the VAR for possible red card offense. Two plays to vote on whether you think they are a deliberate play by the defender and thus, no offside infraction. On the day, one of these decisions (LA v SEA) the flag was raised and the other (NY v MON) it was not. Next week we will analyze and provide the answer. VR Note: Neither of these plays would have been reviewed as goals were not scored. Three choice to decide from. Of course, Nick Uranga in Houston v Portland has to be included. However there were some other good decisions like Jonathan Johnson in Dallas and Peter Balciunas in Atlanta. Who had the best call of the week? Who had Call of the Week #21? VR Note: All three of these plays would have been checked. In Dallas and Atlanta the VAR would have said "check complete" before the kick-off to verify the goals.